"After joining HiRisers, I started to gain a bit more confidence and energy every day I went in. I learned to speak clearer, stand taller, and react better." Urban Dove energizes at-risk students through a sports, nutrition, and fitness program that focuses on developing teamwork, healthy competition, and self-confidence for academic and life success. Urban Dove educates over-aged, under-credited students through a 3-year project-based, personalized instructional program that leads to a high-school diploma, a foundation for higher education, and the job skills needed to enter the world of work. 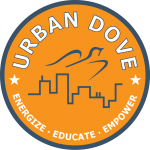 Urban Dove empowers disconnected youth by providing leadership opportunities, internships, and support so they can build confidence and self-esteem.